Lexis presented its new product in a more low key fashion. No flashing screens or classical musicians, just a solid presentation by Lexis reps, with Microsoft engineers available to answer questions. Lexis for Microsoft Office will be introduced to law firms this spring and to the academic marketplace in the fall. 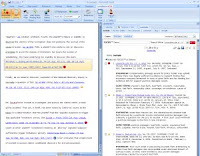 It allows users to access Lexis while reviewing an Outlook email message or Word document, opens relevant information from Lexis on the right and embeds links and Shepard’s signals into the Outlook email or Word document. It includes a toolbar that lets you Shepardize while still in Word, with the Shepard’s results showing up on the right. It seems like it will be a real timesaver, in that it allows you to edit documents and research with switching between tabs or windows. This news release has more information.